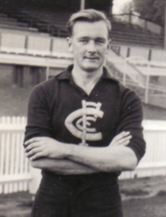 Wearing guernsey #30, Stafford played 25 games for Carlton after debuting in Season 1951. Stafford was a member of the under 19's 1949 premiership team and the 1951 and 1953 reserves premiership teams. Stafford was cleared to play for Brighton for the 1955 season. Stafford was recruited from VFA club Northcote, he is the younger brother of fellow Blue Fred Stafford. George Stafford died on July 30, 2010 aged 77 years old. George was involved in a fracas at the 1954 U19 Grand Final between Carlton and Footscray. The V.F.L. investigated and disqualified Stafford for the first 4 games of the 1955 season. Contributors to this page: Bombasheldon , pblue , blueycarlton , WillowBlue , tmd1 , molsey , p(12)terg , dgreen2 and admin . Page last modified on Tuesday 07 of May, 2013 20:16:34 AEST by Bombasheldon. 1969 Rd 7 - An injured Barassi leaves the ground in his last game as a player.